Catholic Confirmation is the sacrament that strengthens us in the faith until final perseverance. It gives us the weapons necessary to fight our own faults, the devil, the flesh, and the world. Learning its definition and the other Baltimore Catechism No. 2 Confirmation answers to the quiz questions is easy with practice. The Baltimore Catechism is the best trusted Catholic catechism in English. Children learn it right the first time. It has a long history since 1885. It has wonderful prayers like the perfect Act of Contrition. Depending on how old you or your children are when you have the opportunity to be confirmed, you will want to read different books. Confirmation Audio Clips - Hear samples. Audio recordings are great if you'd like a tutor to help your children memorize their prayers and answers. They're like keeping a tutor on file. This page shows all the words your children will hear. 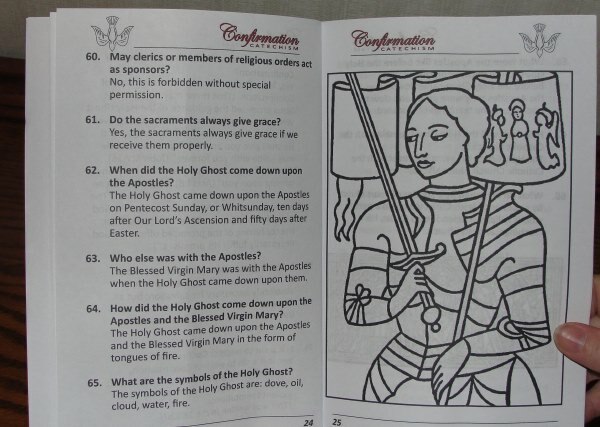 Printable Confirmation Preparation Booklet - Uses the same texts. Confirmation Quiz, Worksheets, and Copybooks - See sample worksheets in both manuscript and cursive writing and uses the same texts. 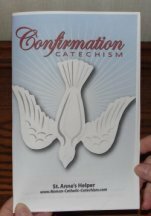 In preparing our children for Confirmation, you will find that the Baltimore Catechism even in its many versions throughout the years has had the most precise and concise Catholic answers. You can study many books to find that some catechisms have answers that leave room for doubting the very sacrament itself; yet, this is the very sacrament that gives confidence: confidence - con fide - means "with faith". How can one have confidence when the booklet has conflicting answers? You can't. Neither can your children. 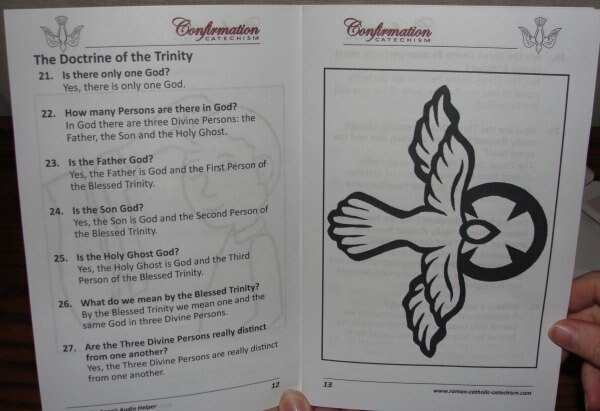 This is why you'll want to use the best version of the Baltimore so your children can learn the right Catholic Confirmation answers the first time. Be encouraged to help your children to study these answers and to prepare well so that they receive the most graces possible. This is serious, but it is also a joyful process. Just wait till your children are all confirmed! It's a truly great day. Check one more step on the path to Heaven. The better they prepare the more well armed soldiers of Jesus Christ they will be. This is the way to have an easier trip to the highest place in Heaven where God wants you. Confirmation confers the strength necessary for us to persevere. It gives us the right to the graces necessary to be Jesus' soldiers in all that we do. If you are fortunate enough to have the great grace to be able to receive Confirmation or get it for your children, go for it. You and they will get to Heaven more easily. You'll find it is such a great grace for your children to receive this strength and the sacramental graces now, so that our happiness in eternity is brighter and surer; and our lives here on earth are safer and happier. Many Catholics today are not convinced that there is a need for the sacrament of Confirmation which is just too, too, sad because they miss so many graces. Not receiving Confirmation is a reason so that many Catholics are not strong in their faith or have to watch their children and grandchildren leave the faith. Worse, many bishops are delaying Confirmation till the children are out of school. At one point I received several calls a year from catechists and parents who complained that their bishop requires the confirmand to be 18 years old. Parents are afraid that. if their children do not prepare for Confirmation during school, they will not have the time or motivation to do it later in life. I think these parents are right. You can teach your children these truths on your own. That's where Saint Anne's Helper Catholic Confirmation resources are so helpful. Even if you simply copy the audio files to an MP3 player for your children to hear, they'll have heard the truth. If they're trying to memorize the answers, the audio is a huge help - especially for audio learners! Give them headphones for a better experience. Visitor Question: What Is Included? Mary Answers: Thank you so much for your good questions. I so heartily understand your concerns. It is so important to have good questions and answers, so I am edified by your care. And the questions about the Holy Ghost. It is not the whole BC No. 2. The prayers and questions like the Ten Commandments are exactly the same as the 1885 version of the BC as published by the old TAN Books. Including the prayers, there are 76 questions. The enemies we are to fight and the weapons we are to use. The Gifts of the Holy Spirit are explained as definitions. And the audio file. The CD can be played in any CD player and is a huge memory help. Use either for Confirmation quiz practice. Since the worksheets are interactive, they make great typing practice for older students because they can type the answers in their favorite fonts, colors, and SIZES right from the computer (no ink, no paper). There are also four quizzes (3 pages each) that you can use as practice tests, actual quizzes (one page at a time), or as a test. If you buy the ebooklet download, you'll have a small copy of the same questions and prayers with Confirmation symbols and coloring pages included. Long story short? You can use what you have in the Baltimore Catechism No. 2, copy the questions at the link above, or use our resources to make assignments easier. Let me know what you think. I really appreciate all inquiries. Others may have the same questions. Did you know that the Baltimore Catechism is based on the Council of Trent catechism? Infants - The sacrament of Confirmation can be received even by infants, especially those in danger of death. Children - It teaches that even those who have merely attained the use of reason can and should receive the sacrament. They are old enough to remember receiving Confirmation. Adults - We need the strength of this sacrament for final perseverance. If you want more than an outline, The Catechism of the Council of Trent (CCT) is a wonderful book. The BC No. 3 is an outline of the CCT. 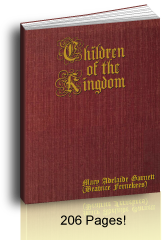 The full book tells the Bible, historical, and saints stories that go with the catechism. Oh, and if you or your students are curious, the Catechism of the Council of Trent is not a tricky book to read. You'll find it to be very interesting. It is perfect for high school children in eleventh and twelfth grade. For teaching Confirmation class, you'll want to teach the main stories in the New Testament and saints stories so that you children have models to choose for their Confirmation names. On Pentecost Sunday, 10 days after Ascension Thursday, the Holy Ghost descended upon the Apostles who were made strong enough to teach the Catholic religion, and thousands of people converted to the Catholic Faith that very same day. We need the same graces in our day. Guess what? He confers those very same gifts on each one who receives the sacrament of Confirmation worthily throughout all these centuries. Also, when we face a spiritual battle we can count on the graces necessary to win; be encouraged, we have the right to these graces! Pray for an increase in graces. A plus would be to read about saints. Children to be able to write the answers. Huge amounts of extra study. There are many saints who could neither read nor write and there is a huge percentage who led very hidden lives. Do not worry that your children have to be academically sharp to receive Confirmation. As a matter of fact, Confirmation can give them the wisdom, understanding, and counsel necessary to improve their thinking abilities as well as their spiritual graces. 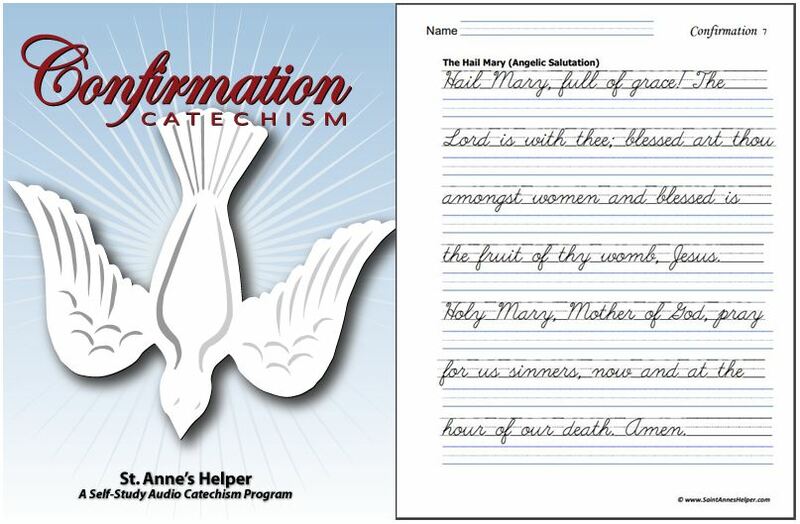 Saint Anne's Helper's Catholic Confirmation catechism asks the question What is Confirmation? rather than the subjective "What does Confirmation do for you?" It gives the Catholic answers with clean definitions that do not cloud the truth. 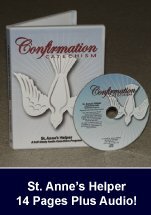 Audio catechism and printable text. "Holy Chrism is composed of olive oil and balsam blessed by the bishop on Holy Thursday." Chrism is made of olive oil and balsam as taught in the old Catholic Confirmation catechisms. If the matter (chrism) and form (words) are correct, we can be certain that we are receiving the same gifts as the Apostles and Mary received at Pentecost. This question is very interesting today as traditional Confirmation ceremonies still use olive oil. Who are the enemies a soldier of Jesus Christ must fight against? "The enemies a soldier of Jesus Christ must fight against are namely these three: the world, the devil, and the flesh." Which weapons has Jesus Christ given us to use? The seven gifts and twelve fruits of the Holy Ghost." The weapons we are to use in our daily life are the same as Jesus Himself used, like prayers and sacrifices. There's no big social project necessary. Confirmation is the sacrament that gives the grace to even very small children to be brave enough to confess the faith even unto martyrdom. It also gives us the right to God's grace in our everyday lives. Count on it. A good Catholic Confirmation catechism teaches the important facts about the sacraments in a true, concise and memorable manner. For example: One who is Confirmed needs to know when to honor the Third Commandment. Does your catechism teach the Catholic Ten Commandments? Does it teach the Catholic Holy Days of Obligation? They're still the same in the United States as when they were listed in the original Baltimore Catechism. 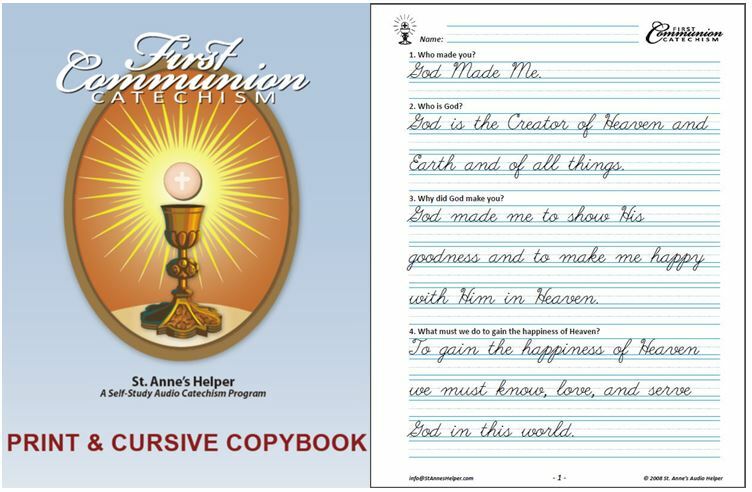 If your Confirmation catechism does not have these same answers, you might want to supplement your program using our downloads (see below or on our order page). Choosing a Catholic Confirmation name can require much study if you are searching for that perfect patron saint! An idea is to think of your favorite name and find out what the saint was like, or read a collection of saints lives to find your favorite patron saints. It is easy if you have already been reading good Catholic books about the saints'. It is very good to study the Roman Catholic saints the year before Confirmation preparation, so you are familiar with the choices you have for your Confirmation name. See our growing list of Roman Catholic saints. Saint Martha, patroness of Homemakers and Hospitals. Here's more information for choosing a Confirmation name based on a saint's story you like, a name you like, or for what virtue the saint is patron. Other ideas are to check lists that are found in Catholic liturgical calendars and the book Is it a Saint's Name? by Tan Books. 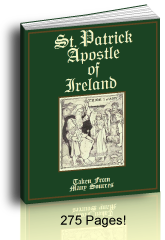 This last may well be yours favorite Catholic saints lists because the booklet has instructive information about naming in general and Catholic names in specific. May God grant you a long and holy life! St. Joan of Arc was first a Soldier of Jesus by her Catholic Confirmation.